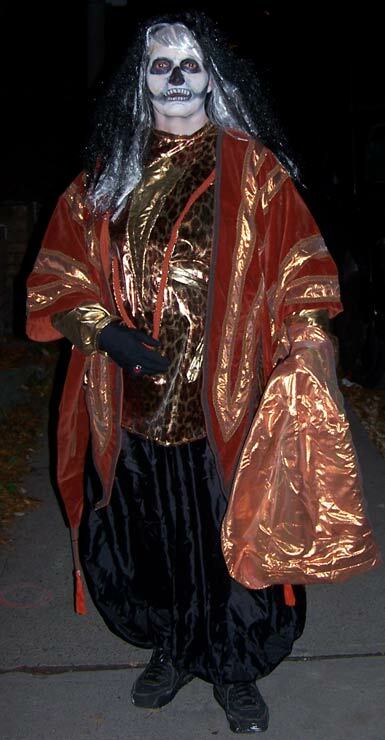 This is a costume that photographed terribly. The coat comes with a cowl that makes a great hood. It's in my hand. I eventually wore it with tight black pants and it works much better. I wanted to try a skeleton face. Cheap wig and made a lame shirt. Coat has several points going down including one large one at the back. The sleeves also end in a point, they have tassels on the bottom. The flash shows the neck but in fact it was dark and did not show. The face seemed to float disconnected. The face was quite scary under lower light. The face worked quite well. I had mixed a cream colour in the white and added some yellow here and there. 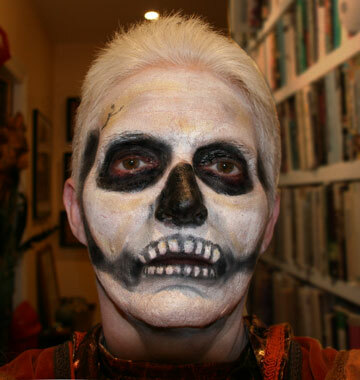 The cheap make up did not allow gradations so pretty rough make up. Finances did not permit professional make up. This is all dollar store grease paint bought at half price the day of Halloween. I had the fabric already so no real cost there. The wig set me back about 5 dollars. Here is a link to bustle.com on 11 skull make up tutorials. Lovely! I was experimenting with wigs. 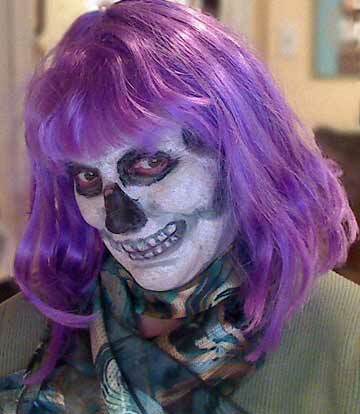 I quite like the effect of the face and the purple wig. It made the red around the eyes show up. It's also quite incongruous.